One of the biggest road races in the region, thousands turn out annually to take on this fantastic challenge. Attracting people from across the UK and abroad, it boasts a route that takes in some of Lincoln’s historic landmarks, including the cathedral and the city’s Roman Walls. 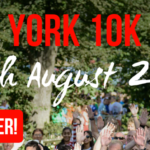 Run for fun, for charity or for a personal best on this flat and fun course.